Carin Crook and Kirstin Cerulli, two moms who met through their kids’ school PTA, are on a mission to change the world, one natural treat at a time. Tired of pops and novelties filled with artificial colors, chemicals and ingredients that stain clothing on the outside and do who-knows-what on the inside, they teamed up to start an ice cream truck that offers “way better cold stuff” than is typically found on traditional ice cream trucks. The seed of The Natural Scoop was planted in 2006, when Carin was vacationing with her family in Cape Cod. While on the beach, the jingle of an ice cream truck caught the attention of her 2-year-old daughter. Having fond memories of an ice cream truck coming through her own neighborhood as a kid, Carin was happy to buy her daughter a treat—until she saw the truck’s offerings: pops and novelties filled with artificial colors, chemicals and foreign ingredients, not to mention no options for people with food allergies. Carin knew there had to be a better way. The two friends put their heads together, and a new kind of truck was born. Introducing The Natural Scoop: Way Better Cold Stuff. All natural frozen treats. No chemicals or artificial anything. Ingredients you can pronounce. Allergen-free brands you can trust. Taste you’ll love. Carin and Kirstin’s first step was to create an ice cream truck in their home town of Ridgefield, Connecticut, that parents would embrace and kids would love, with great options for people with specific food allergies, sensitivities or preferences. Thanks to the generosity and support of family and friends through Kickstarter, they launched The Natural Scoop in spring 2015, and it was a huge hit, with interest from across the country! They worked hard to give back to the community, donating to a number of charities, and will continue to pay it forward and help other small businesses get started. The next step? 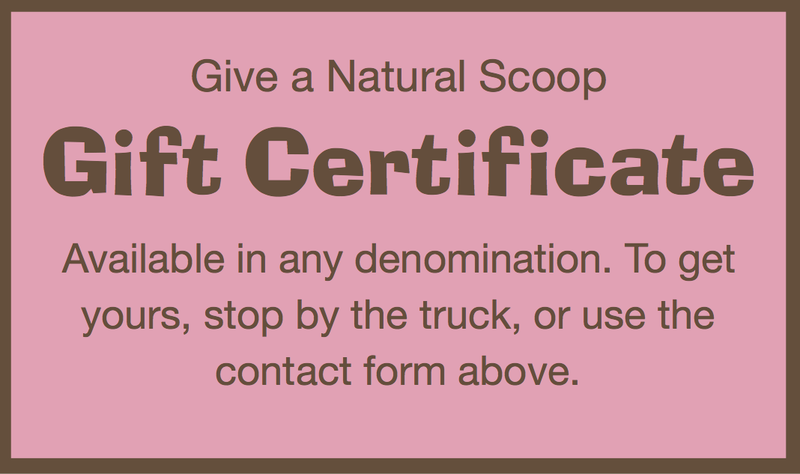 To realize their big vision of turning The Natural Scoop into an affordable franchise, so wherever you go in the country (the world! )—to the beach, to the park, outside your house—you and your kids can get a treat that tastes great and you all feel good about. “Our prices are comparable with traditional novelties, showing that eating naturally doesn’t have to cost more,” said Carin Crook. Come taste the difference for yourself.